On 28.10.2017 Vasu & Co Sold the following stock items to M/s.MTC PVT LTD, Maharashtra vide Invoice No: 9/2017-18. Supplier State is Telangana and Customer State is Maharashtra. 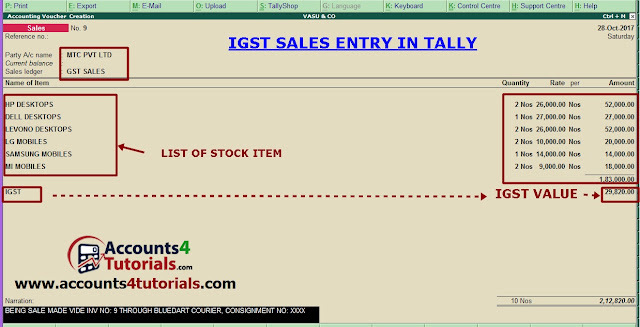 This is INTER-State (Outside State) Supply and applies IGST. When creating MTC PVT LTD Ledger take care state selection, gst details. 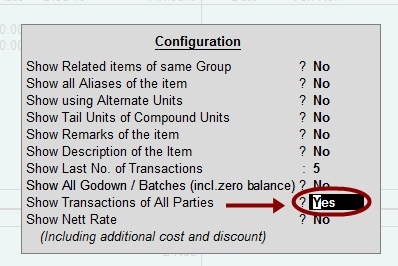 Hint1: Press Alt+S to know Purchase Rate details in Stock Query Window. Hint2: In the Stock Query Window, Press F12: Configuration: and Show Transactions of All Parties set to Yes and Press Enter. Tally shows HP DESKTOPS sales details to all other customers. > Press Esc to go to Accounting Voucher Creation. > Press CTRL+A to save sales voucher.